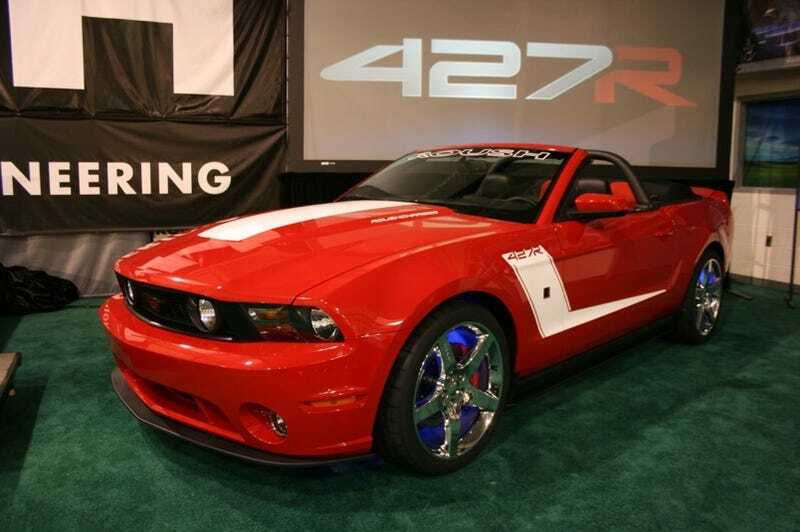 We're live-blogging the 2010 ROUSH Mustang 427R reveal here in Livonia, Michigan. Hit the jump for the first pictures of this svelte new boy racer. The day is finally here: The 2010 ROUSH Mustang bows it's pointy head and shows itself to the world. The notable features of everyone's favorite custom pony includes 435 HP, 400 lb-ft o' torque, no gas guzzler tax for manual transmission cars, a ROUSHcharger available at launch and a very functional aero package. The Stage One starts at $34,847, Stage Two begins at $36,221 and the Stage Three 427r kicks off at $43,051. We recently reviewed the 2009 ROUSH Blackjack, which represented the top of the line as far as ROUSH customs go. While our final impression was ROUSH did the best they could with a failing platform and ultimately left with a reasonably good car - the new ROUSH promises to be a whole different beast; especially now that the interior is fit for real, live adults. The production volume for the 427r is estimated to be 2,000 units per year - and the first two months are already sold out. Look for our First Drive of this latest iteration of a legend in the coming months. The ROUSH 2010 427R™ Mustang will be the first in the lineup of new ROUSH® 2010 Mustangs to have a ROUSHcharger® installed which boosts the horsepower to 435 and offers 400 lb.-ft. of torque. This is the first time that ROUSH has been able to offer a supercharged vehicle at the launch of a new body style. Under the hood customers will see many differences in the ROUSH 2010 427R Mustang compared to previous years. One of the biggest changes is that the long air induction tube that wrapped around the engine was eliminated making a much cleaner appearance under the hood. The intercooler reservoir has more than twice the volume of previous generations, and the intercooler itself is a single core cross-flow radiator which means more efficient cooling. It is substantially larger than on prior model years, and is now raised higher off the ground which should offer much less potential for road debris damage. Even the hoses on the ROUSH 2010 427R have seen an upgrade; they are all now 100 percent molded rubber with abrasion resistance and have imprinted markings for things like the clamp locations. This makes for even more of a true OEM appearance under the hood, and ROUSH has taken this factory appearance to the degree of matching the Ford grain on the OEM radiator reservoir and duplicated it on the one used by the intercooler. Although much of the 4.6L, 3V powertrain components are a carryover from that used on the 2005-2009 ROUSH Mustangs, customers will notice much more refinement and OEM-level quality materials and appearance on the new ROUSHcharged™ engines. This new 427R™ is be covered by a 3-year/36,000 mile warranty. The 2010 427R™ includes an appearance package which is comprised of several components such as a new front fascia and front splitter, rear fascia, side splitters, and a three-piece rear wing. The new rear fascia is a one-piece design which improves the fit and finish; the part is injection-molded by ROUSH Manufacturing in an OEM-level TPO plastic which, in the black color with decorative grain, will help reduce rock chips. The vehicle rides on 18-inch cast chrome wheels with high-performance Cooper Zeon tires, with a new 20-inch cast chrome wheel as an available option. This package also includes an all-new suspension package to greatly enhance the handling of the vehicle and turn that daily commute into a slalom course. The ROUSH chassis engineering team has driven tens of thousands of miles on the streets and tracks to create the best blend of comfort and handling, and claim that this is the best suspension package they have come up with yet for the Mustang. A ROUSH wheel hop reduction kit will be included with all vehicles that have the upgraded ROUSH suspension package installed at the factory. "I've driven every generation of ROUSH Mustangs and there is no question that these cars keep improving over the years. Our engineering teams never sit back and say,'That's it. We are done working on this now.' They continually refine the components, whether it is in the engine, suspension, or any other part of the car. They are always thinking and testing and improving and creating the ultimate Mustang for the muscle car enthusiast. I think that there is no doubt that the ROUSH 2010 Mustang is our finest effort yet," Roush stated, adding that he will shortly be using one as his personal vehicles while traveling the NASCAR circuit. Click here for the official ROUSH Accessory cost table.